Urinals are an increasingly popular water saving option. According to Kohler, waterless urinals can save 40,000 gallons of water per fixture per year. 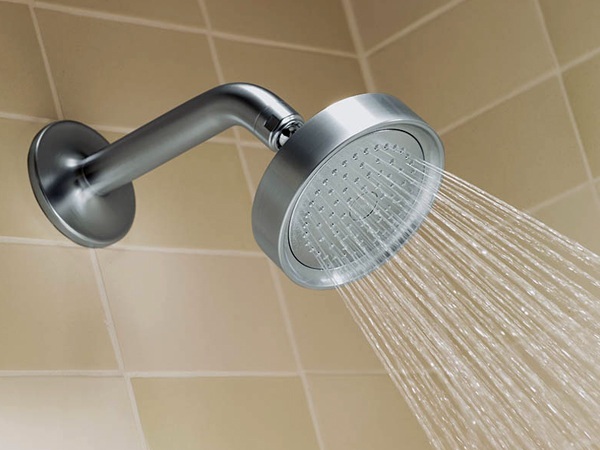 Some people are reluctant to switch to low flow showerheads because they have had bad experiences with older, low-flow showerheads that lacked water pressure and performance. Today’s high-efficiency showerheads combine water savings with high performance. An added benefit of using high-efficiency showerheads is that they also reduce home energy costs by using less hot water. The EPA estimates that the average family use 370 kilowatt hours less of electricity annually. That amount of energy could power a house for 13 days, just by switching a showerhead. Inefficient/old showerheads typically used more than 2.5 gallons of water per minute (GPM). High efficiency showerheads use 2GPM or less. A high efficiency, water saving faucet only uses 1.5GPM vs. old, inefficient faucets that use 2.5 GPM or more. Another option to save water is to put an aerator on your current faucet. To save money, replace the faucets in your home that get the most use first, like the faucet in the kitchen and main bathroom. Switching out old, inefficient plumbing fixtures for new, high efficient plumbing fixtures is an inexpensive way to save on utilities verses purchasing a new washing machine or hot water heater. In addition to saving money, installing efficient plumbing and reducing water use helps protect the community’s water supplies. According to the EPA, less then 1% of the earth’s water is available for human use. Water is our most vital resource and low flow fixtures are a great way to save water without compromising performance.